﻿﻿‘A cheeky man with a heart of gold’, is how we will always remember our mate John Balzer, one of our staunchest Landcare members - who sadly passed away last month. John was also known in the community through his activities with the Lennox Surf Club, where he was a long serving and active member. The news of Johns passing came to us all as quite a shock, John was a man so full of life, energy and spirit. 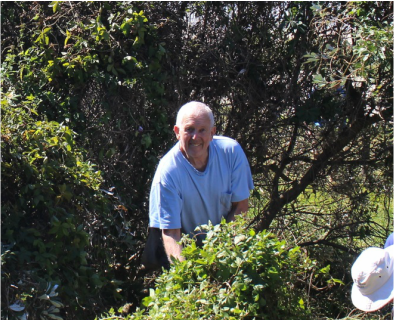 Almost every wednesday for the last 9 years, John has turned up to Landcare and worked with great gusto and enthusiasm. Johns contribution to the Landcare group was enormous and there was rarely a day when he wouldn’t wear the price for his efforts, often emerging from the bush absolutely covered in cuts and scratches. But it’s Johns character that we will remember him for most. The following words come from some of our members. There’s a beautiful Pink Euodia tree at Boulder Beach which we planted in memory of a previously passed Landcare member. And if you didn’t know the significance of this tree you might have been mistaken in thinking that John was a slightly crazy character who liked having conversations with Pink Euodias. ‘How you going mate?’ John would say as he approached the tree, some 30 seconds later every weed growing over or around the tree would be torn away. John did this whenever we worked at Boulders, this was John as we knew him - a tough old softy. In the beginning - we all start out at Landcare with a shared passion and interest for the natural environment. But what keeps us coming back week after week are the personalities, the conversations and the friendships. It saddens us to have to say goodbye to our mate John - he will be sorely missed.